It looks like WotC has made a D&D 5e publishing license irrelevant at this time. Publishers are either using the 3x OGL or trademark fair use and publishing 5e compatible works. Instead of having some influence over what get's published, they no have none. Troll Lord Games, publishers of the Castles & Crusades RPG, are now the latest to jump on the 5e bandwagon, converting one of their C&C adventures, The Rising Knight, to 5e. Complete with customized anchored hyperlinks! 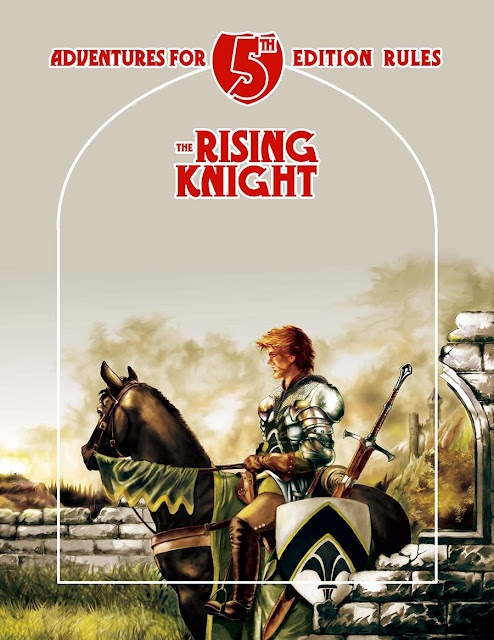 Click on the map for locations in the Rising Knight! This is an introductory adventure for those playing the 5th Edition of the world's best known and oldest RPG. The module has been designed to allow for the players and Game Master alike to begin play immediately. The Drunderry River runs narrow and fast through much of its course, before tumbling into the lowlands beneath the Fallow Hills, in the shadows of the Blacktooth Ridge. From there, the river spreads out across fertile plains, laboring slowly to the south before emptying into the Elmarsh Lake. Until recently this area was unsettled, but a writ of the King's has brought many people to the area. The village of Malforten, nesteld along the banks fo the Drunderry River, near the Fallow Hills, is just such a place. A quiet village with simple people, they learned the hard way the Blacktooth Ridge casts a deep and dark shadow. Seeing rich prizes in cattle and grain, people and other movables, Gritznak the Gnoll has come down from the Blacktooth with loot on his mind. All they've done to drive him off have failed, at their wits end the villagers turn to others, more experienced in combatting evil. They look to a rising knight to save them . . . . Cool. I'm glad they did it. Do you think we will see a glut of 3rd party OGL products as we did 15 years ago? I hope so - although maligned in some circles, that burst of hundreds (maybe thousands?) of supplements, adventures and alternative core rules was fascinating, and I've enjoyed and appreciated most of the OGL products I bought. I was, however, quite picky and careful about which ones I paid money for. From a realist's perspective, the "5e" stamp is superfluous. All D&D compatible content is usable with 5th edition. I don't care how large a "5" publishers put on the cover, it's not any more or less "new D&D" than the OSR stuff that we've been putting out for years. But from a marketing perspective, it definitely helps.